Added Locations and should be adding cars soon. Finally, someone added this arcade game! I still play it when I have time in the arcade. how the hell you can drive in MAME emulator? i'm stuck in menu ... help me please ._. EscudoPikesPeak wrote how the hell you can drive in MAME emulator? i'm stuck in menu ... help me please ._. anyway, there is the recent (and maybe the last) of Thrill Drive series. 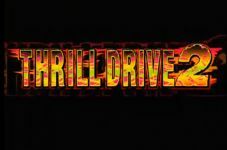 It's Thrill Drive 3, which have a Mazda Demio and a drivable minivan that resembles a Mitsubishi Delica. I would be happy to name the cars if someone can add the game. PikesPeak wrote can anyone help me? Same here, Maybe the game files are corrupt so the emulator can't read it. Anyway, there should be two secret cars in this game. A F-1 car and an APC. You can take a picture the cars with camera. I played it on a bowling alley before it was removed. Btw, if you press the brakes during the car selection, you can access the secret Formula 1 and the armored vehicle.